Kellogg has issued a recall of cereals citing a strange odor and flavor coming from the package liner. 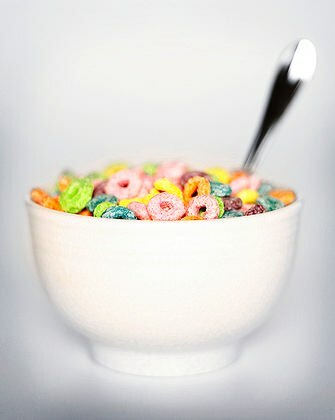 The cereals affected are Corn Pops, Froot Loops, Honey Smacks and Apple Jacks, with the letters KN in the use by date. Of the many complaints that Kellogg received, there were only 5 people who felt ill after eating the cereal. The company does not think there is any major health risk involved, but they are accepting returns on the boxes. According to the World Health Organization, 1.1 billion people lack access to safe drinking water. This year’s winner of the Energy Globe World Award has addressed that issue in an innovative and effective way. Aakash Ganga, or “River from the Sky”, is a sustainable system that channels rainwater from the gutters of every house in the village and then pipes it into a network of underground reservoirs. The system captures enough rainwater to meet the drinking needs of an entire village for 12 months. It is currently being implemented in six drought prone villages in the Churu district of Rajasthan. The system is supplying 10,000 people with fresh water, and the Government of Rajasthan has signed a letter of intent to implement Aakash Ganga in 50 villages to serve 125,000 people. Salt has become the latest in a long line of food substances under siege by nutritionists. Currently, the government is revising the guidelines of its iconic food pyramid to cut the recommended daily amount of sodium from the current 2300 mg. daily to 1500 mg. As a reference point, one teaspoon of salt contains 2325 mg, already over the healthy limit. Our bodies need sodium in small amounts to function. Sodium helps maintain the balance of fluids in our bodies, influences the contraction and relaxation of muscles and transmits nerve impulses. The excess is supposed to be excreted in our urine. Often the body cannot effectively eliminate all of the excess sodium, causing an increase in blood volume, creating a rise in blood pressure and forcing the heart to work harder. This can lead to heart and kidney disease or stroke. The best way to reduce sodium in your diet is to eat more fresh and fewer processed foods. Avoid lunchmeats, bacon and hotdogs, which have nitrates and added salt. Limit the use of sodium laden condiments such as soy sauce, ketchup, mustard, and most bottled salad dressings and sauces. Use fresh herbs and spices, and the zest from citrus fruits to add flavor to your foods without salt. Eliminating salt use slowly will help your palette adjust more easily. 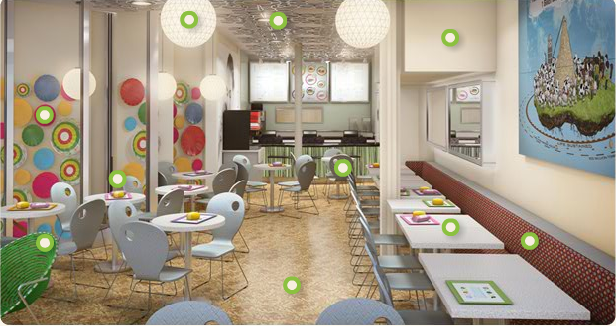 Soon you will be enjoying the natural flavors of fresh, healthy food and the benefits of a healthier lifestyle. New Yorkers are getting used to seeing calories posted at chain restaurants, but this Australian based franchise publishes the carbon footprint of every menu item as well. Otarian, an eco minded vegetarian restaurant with locations in New York and London has a simple mission: to provide delicious, meat-free food while eliminating the negative affects that food production has on our environment. One of the main contributors to global environmental degradation is the livestock industry. The effects of large scale meat production impacts sustainability as well as economics. Greenhouse gas emissions, deforestation, and water pollution are just a few of these factors. Statistics show that if every American gave up eating meat that the population of Africa could be fed with the grain saved. Almost everything in the restaurant is made from recycled materials. The chairs are made using an ancient South African technique that weaves recycled into recycled plastic onto aluminum frames. The tabletops are made from recycled buttons from clothing. Everything is sustainable and environmentally friendly. All of the food comes from the best local farms, where the quality and ethics are high. There is never a compromise in food quality to meet their environmental standards. With each diner making a small but meaningful difference to the planet, Otarian is saving the world one meal at a time. 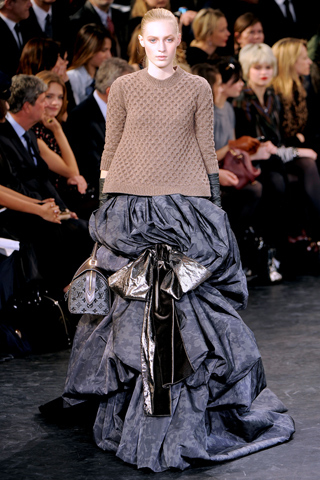 The Louis Vuitton collection for Fall 2010 was perhaps one of the most spectacular shown. Designed by Marc Jacobs, it celebrated the woman, and her form. The silhouettes, reminiscent of the late 40’s into the 50’s were absolutely exquisite. All of them, except this one. Oh Marc, what were you thinking here? I mean, if I had a chance to walk the red carpet, the last thing I would want to wear is a skirt inspired by Little Bo Peep, and a shapeless sweater. I guess when you turn out collections for men and women under 3 different labels, you are entitled to an error in sartorial judgement once in a while. 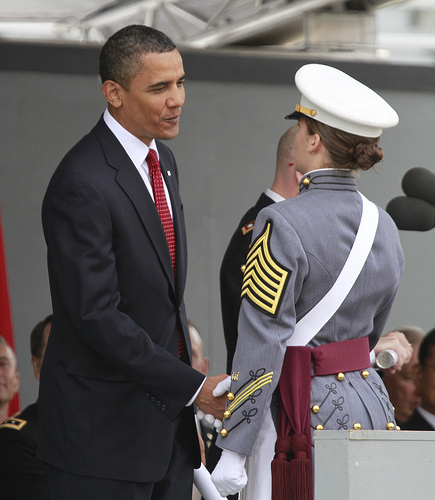 Today seems a very fitting time to share some excerpts from the very moving speech President Obama gave last weekend at Will’s graduation from the United States Military Academy at West Point. “Now even as we fight the wars in front of us, we also have to see the horizon beyond these wars – because unlike a terrorist whose goal is to destroy, our future will be defined by what we build. We have to see that horizon, and to get there we must pursue a strategy of national renewal and global leadership. We have to build the sources of America’s strength and influence, and shape a world that’s more peaceful and more prosperous. Time and again, Americans have risen to meet and to shape moments of change. This is one of those moments – an era of economic transformation and individual empowerment; of ancient hatreds and new dangers; of emerging powers and new global challenges. And we’re going to need all of you to help meet these challenges. You’ve answered the call. 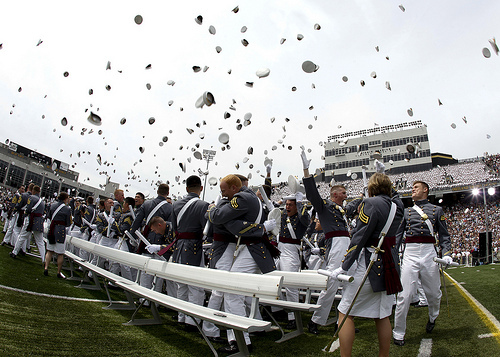 You, and all who wear America’s uniform, remain the cornerstone of our national defense, the anchor of global security. 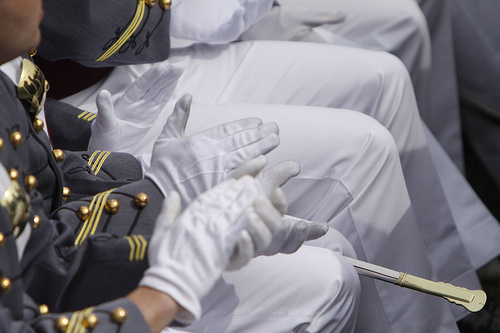 And through a period when too many of our institutions have acted irresponsibly, the American military has set a standard of service and sacrifice that is as great as any in this nation’s history. Now the rest of us – the rest of us must do our part. And to do so, we must first recognize that our strength and influence abroad begins with steps we take at home. We must educate our children to compete in an age where knowledge is capital, and the marketplace is global. We must develop clean energy that can power new industry and unbound us from foreign oil and preserve our planet. We have to pursue science and research that unlocks wonders as unforeseen to us today as the microchip and the surface of the moon were a century ago. Simply put, American innovation must be the foundation of American power – because at no time in human history has a nation of diminished economic vitality maintained its military and political primacy. And so that means that the civilians among us, as parents and community leaders, elected officials, business leaders, we have a role to play. We cannot leave it to those in uniform to defend this country – we have to make sure that America is building on its strengths. But this nation was founded upon a different notion. We believe, “that all men are created equal, that they are endowed by their Creator with certain unalienable rights, that among these are life, liberty and the pursuit of happiness. And that truth has bound us together, a nation populated by people from around the globe, enduring hardship and achieving greatness as one people. And that belief is as true today as it was 200 years ago. It is a belief that has been claimed by people of every race and religion in every region of the world. Can anybody doubt that this belief will be any less true – any less powerful – two years, two decades, or even two centuries from now? And we will commit ourselves to forever pursuing a more perfect union. Together with our friends and allies, America will always seek a world that extends these rights so that when an individual is being silenced, we aim to be her voice. Where ideas are suppressed, we provide space for open debate. Where democratic institutions take hold, we add a wind at their back. When humanitarian disaster strikes, we extend a hand. Where human dignity is denied, America opposes poverty and is a source of opportunity. That is who we are. That is what we do.